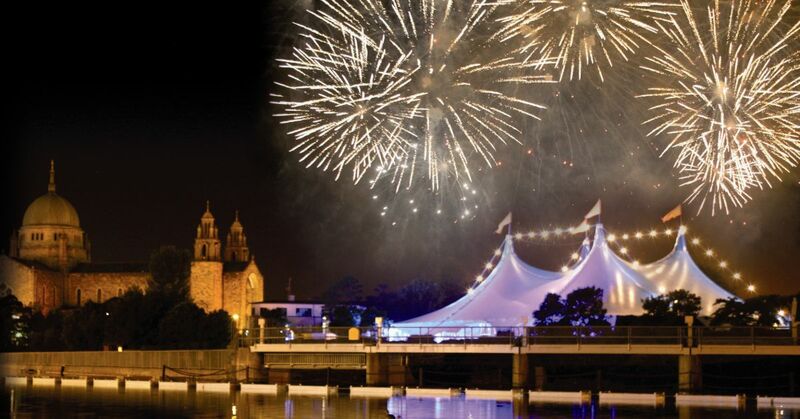 Galway’s festival season is just around the corner and the buzz is already building. As always, there will be a huge plethora of shows, gigs, performances and exhibitions to enjoy at this year’s Galway International Arts Festival, which runs from 15th-28th July. The most impressive of these acts are the list of headliners that will be filling the Heineken Big Top Tent this year. The most recent announcement for the Big Top, and probably the best! Two of music’s most interesting songwriters will co-headline a night at this year’s festival and bring with them many years and many albums worth of music. Conor O’Brien, of Villagers, is one of Ireland’s most critically lauded songsmiths and he has evolved over the years into a great entertainer, also. Villagers’ latest record, The Art of Pretending to Swim, mixes his sharp lyrics with a fresh, disco-influenced sound. John Grant has earned a cult following of adoring fans since starting his solo career 8 years ago. He is particularly praised for his eccentric live performances but his latest album, Love is Magic, has also been receiving 5-star reviews from all over, with NME hailing it as an “arch brilliance that also makes room for quiet introspection”. The Big Top follows Villagers and John Grant with a whopper; the effervescent and exceedingly fun, Bell X1. At what should prove to be one of the most enjoyable gigs at this year’s Big Top, the crowd can expect to hear hits from Bell X1’s critically-acclaimed albums, which include “Rocky Took a Lover”, “The Great Defector”, “The End is Nigh” and “Flame” amongst others. Heineken Big Top audiences can also expect to hear tracks from their latest studio album, Arms, which, in true Bell X1 style, sounds like nothing else in their canon. They’ve got a good track record too, having supported Ed Sheeran at his massive shows at Croke Park in 2015 and sold out The Big Top in 2016. Bell X1 have been nominated on four occasions for the Choice Music Prize for Irish Album of the Year and had three albums debut at #1 on the Irish Album Charts. Bell X1 are one of the true great Irish indie bands and an act you won’t want to miss. The Academic are one of the most exciting Irish bands on the live music scene at the moment. The group of Westmeath school friends will headline the Heineken Big Top following a ground-breaking year which saw them play a series of sold-out Irish shows as well as a massive tour of the US, Europe and the UK after their debut album went to number one in the Irish charts. Galway audiences can expect to hear massive hits such as ‘Different’, ‘Mixtape 2003’, ‘Bear Claws’, ‘Permanent Vacation’, ‘Why Can’t We Be Friends?’ and 2018’s ‘Fake ID’. Through these tracks, and many more, the band has garnered a massive following, critical acclaim and appearances at some of Europe’s most high profile festivals as well as opening slots for acts like Twenty One Pilots, The Strokes, and Catfish & The Bottlemen. Burt Bacharach is one of music’s most legendary figures. Galway is blessed to welcome, to the Heineken Big Top, a songwriter who has won 6 Grammy Awards, 3 Academy Awards and whose songs have been recorded by over 1,000 different artists! Bacharach revolutionized pop music in the 1950s and 1960s with a dazzling discography that includes 48 ‘Top 10’ hits and nine No. 1 songs. You’ll be dancing along to classics such as ‘Alfie’, ‘Anyone Who Had a Heart’, ‘Arthur’s Theme’, ‘Close To You’, ‘Do You Know The Way To San Jose’, ‘I Say A Little Prayer’, ‘I’ll Never Fall In Love Again’, ‘This Guy’s In Love With You’, ‘Walk On By’, and ‘What The World Needs Now Is Love’. His compositions have been recorded by legendary artists such as Frank Sinatra, The Beatles, Barbra Streisand, The Carpenters, Neil Diamond, Dionne Warwick, Aretha Franklin, Elvis Costello REM, Tom Jones and Wynonna Judd. With all of this taken into consideration he was awarded a Lifetime Achievement Award and was proclaimed “music’s Greatest Living Composer”. This is a once-in-a-lifetime chance to experience a huge part of musical history. Two Door Cinema Club are one of the most commercially successful bands to come out of Ireland in decades. Their tracks have billions of streams online and are a feature of almost every cool party playlist. Their live shows will make you dance! They’ve been described by the Express as a ‘festival must-see’ and the Independent as ‘vibrant, punchy and impossible not to enjoy’, ensuring that another great night is in store when they take to the Heineken Big Top stage at Galway International Arts Festival. Expect to hear tracks from Tourist History, selected for the Choice Music Prize for Irish Album of the Year 2011, including massive tunes such as ‘Something Good Can Work’, ‘Undercover Martyn’ and ‘What You Know’. They followed this critically acclaimed debut album with 2012’s Beacon, which debuted at number one on the Irish Albums Chart, and 2016’s Gameshow, which was in the top 10 in both the UK and Ireland and charted across Europe, Australia and the USA. This is definitely a show to go to with a few mates and get loose. With nine studio albums and three decades of electronic dance music performances to their name, ORBITAL are known for their legendary live shows in front of huge festival crowds. Their live performances are so good, in fact, that Q Magazine included them in their 2002 list of ‘50 Bands to See Before you Die’ and their performance at Glastonbury in 1994 was named in the ‘Top 50 Live Shows of All Time’. ORBITAL’s diverse hits include remixes of Madonna and Kraftwerk and collaborations with soundtrack composer Angelo Badalamenti and Metallica guitarist Kirk Hammet. Known for live performances incorporating improvisation, they were joined on stage in Glastonbury in 2009 by actor Matt Smith for a remix of the Doctor Who theme. Heineken Big Top audiences can expect to hear classic singles like ‘Chime’, ‘Style’, ‘The Box’, and ‘Satan’ as well as songs from their latest studio album, Monsters Exist, released September 2018. See for yourself why ORBITAL won NME Awards for ‘Best Dance Act’ and ‘Best Live Event’. Don’t miss their only Irish gig of summer 2019!